Hey friends. Today, I have a fancy (low FODMAP) potato recipe. I love a good potato dish. This recipe does take a little time to put together but it is not difficult. You do need the right size pan (see recipe) and a mandoline slicer. This is just one of those recipes that is fun to look at visually but also tastes so yummy. I was inspired to create this recipe after perusing Pinterest the other evening. The original recipe inspiration can be found here. The original recipe used about 12 pounds of potatoes and duck fat. This sounds very decadent and certainly will feed a lot more than my modified version. It does not contain FODMAP ingredients –so is another version you could try! 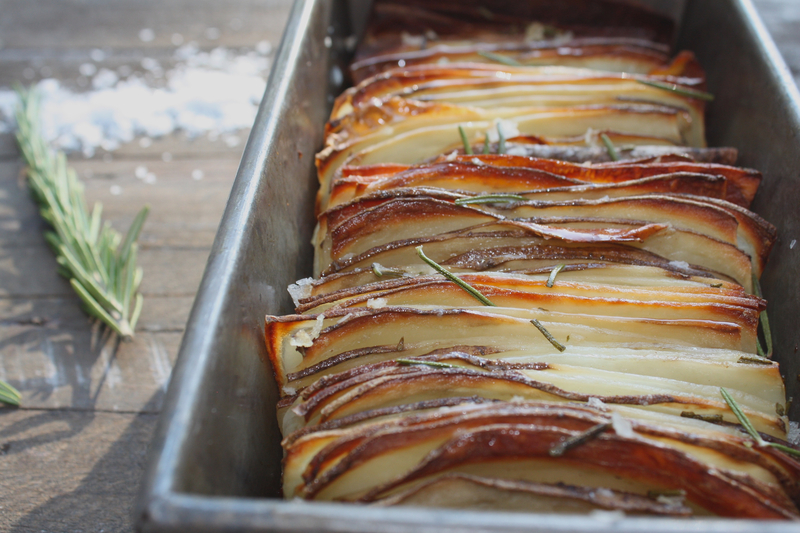 I dressed up the potatoes in my recipe with a little fresh chopped rosemary and Maldon sea salt flakes. 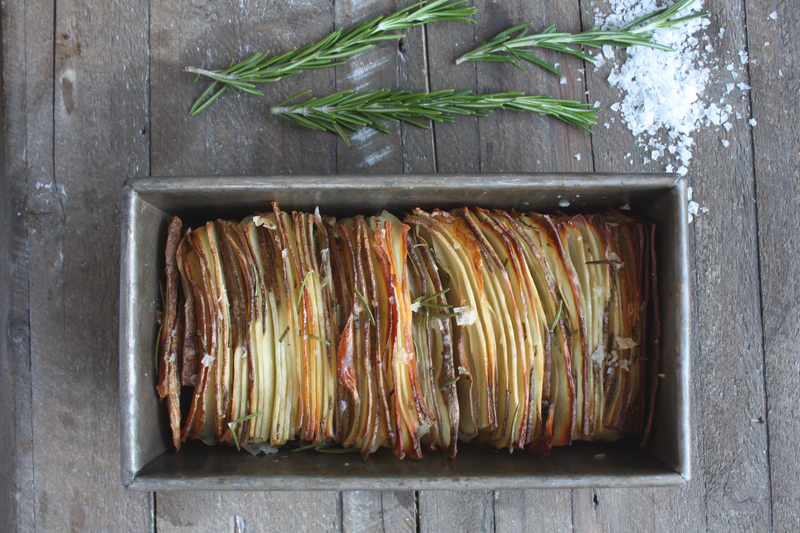 The potatoes cooked up with a soft and creamy center layer and a nice crispy edge like a potato chips! This potato dish can be served with scrambled eggs and fresh fruit for your next brunch (hey….Mother’s day is around the corner) or as a delicious potato side dish with grilled salmon or steak and sauteed green beans. 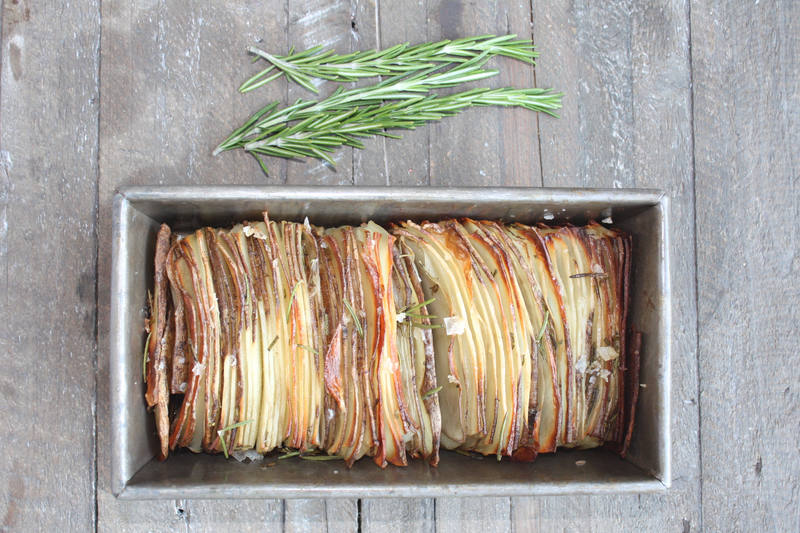 Using a mandoline slicer, slice the potato into long thin rectangular strips (slightly thicker than a potato chip). Using a basting brush, brush the cut potatoes with oil or alternatively, spray them with oil. I used the La Tourangelle avocado oil in a spray bottle. Layer potatoes on their side in the pan, with the wide side of the potato in the bottom of pan. Trim potato edges if they don't fit in the pan. Drizzle butter over the tops of the potatoes. Bake for 1 hour 30 minutes.